the first mr. summerfield and i were vacationing in a beautiful seaside town north west of the old country about 40 years ago, part of our attempt to get him off the bottle. we stayed in a beautiful little cottage which was a smaller version of a typical spanish house. the living room was facing the sea on the west and it was such a picturesque sight in the afternoon as the sun was setting. he had previously bought me a cassette tape of simon and garfunkel during one of his business trips abroad, as we were having our afternoon tea, we were sat on a two-seater facing the picture window, each of us reading a book -- he was reading john le carré and i was reading the pearl s. buck novel "the good earth", the tape was playing in the background. then the song "the dangling conversation" came on. it was the first time i ever heard the song and at the first line, i looked out and saw that the sun was just about to disappear beyond the sea's horizon. i was gazing out the picture window until the last note of the song has faded but when i turned to john, i realized he had also stopped reading and looking out and he was crying. i asked him which part of the song touched him that made him cry. he said the concept of a relationship dying made him sad. i thought it was a bit weird that he was reacting to the death of a relationship when we had just got married. this afternoon i accidentally came across this song. i have not heard it for a long long time, certainly the last must've been before i left oman for canada. listening to the poignant lyrics and the beautiful guitar accompaniment, plus the glorious harmony of the voices of simon and garfunkel, it certainly took me back to that long ago moment. and that gave me the idea for this composite. paul simon's poetry is exquisite and his music is beautiful. the songwriters of my era were prolific writers and poets and brilliant musicians, and it's very seldom these days that you will hear a beautiful song with beautiful lyrics. here have a listen. for week 16 of the 52-week challenge; this week we are to tell a story using shadow. it's quite a disconnect as there was no boat in my story but it being a small seaside town, i'm sure there would've been boats on the sea that afternoon. 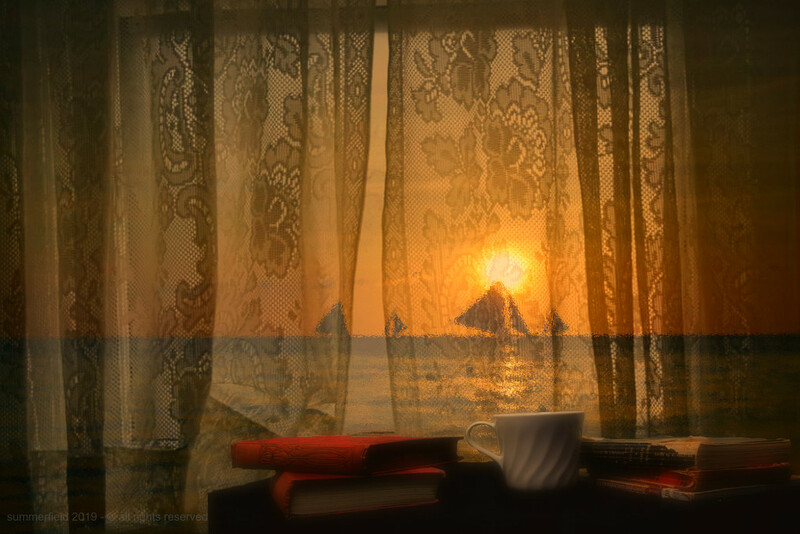 the sunset view was taken in 2016 when bestie and i went to boracay island during our visit to the old country; the lace curtained window was grabbed from google images, while the books were shot today. processed in PSE11 and in ribbet. This is a lovely composite that calls for a moment of reflective calm. I have always enjoyed that song and your shared memory is very touching. You certainly have a way of bringing your readers into the room to experience the feelings of the moment! I don't know this song but now I do and just love it - the words and the music. Sounds a bit like your story! I love this song and this picture. Paul Simon has been one of my favorite poets for a long time now. Love how you describe it and made the composite to go with it. It really touched me. fav. FAV for the insight and emotion. Impressive composite that depicts the song AND your story so very well! Paul Simon and Art Garfunkle are from "back in my days" as my DH used to say. They penned and sang wonderful and eclectic music together and separately. The composite is wonderful. It goes very well with these lyrics.